Hello everyone — Alex here. We will update with photos of the dishes once we receive them after the event. 60 people isn’t too much more than my Mom has done here at the house for one of our Sukkot dinners, so she has the organization before such an event down pat. No hectic moments. 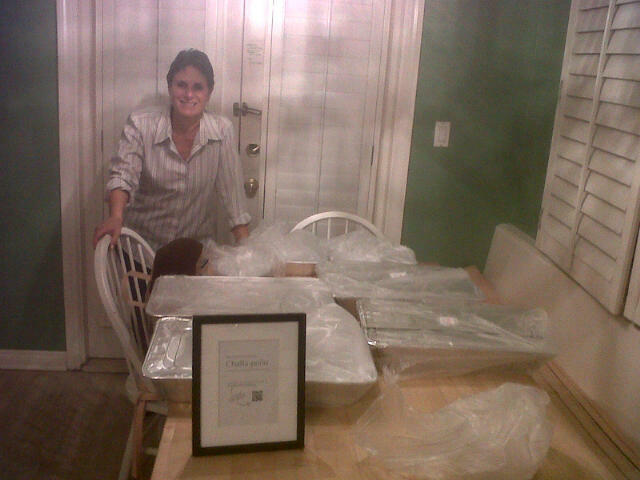 It was very cool (and a little odd) to pack it all up in aluminum, label it and send it off. But it was a very happy and proud moment. Also: I’d like to announce that this is the beginning of our availability as caterers for certain select events around the Los Angeles area! Please get in touch if you want to discuss at susanak@earthlink.net. 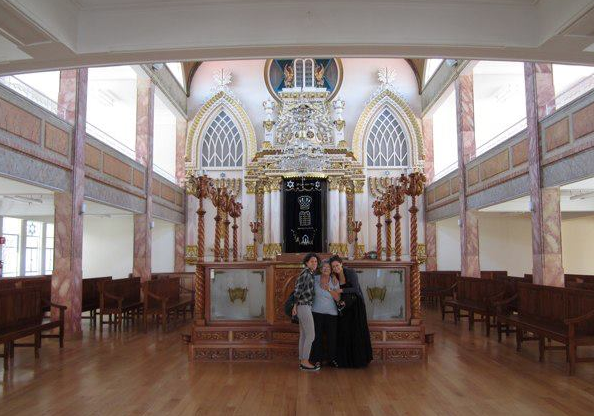 Thanks as always for reading and sticking with us through our Mexican Jewish journey. We’re going to end Comfort Food Week — a tribute to the food-centric help we got when my grandmother passed away last month — with a list of thank you’s and 2 dessert recipes. Thank you for sticking with us during this difficult period, and please stay tuned as we resume regularly scheduled programming (very soon). Julie Platt, Gail Nussen, Sara Aftergood, Marci Spitzer, Patti Felker, Dawn Smalberg, Helen Weston, Rita Segal, Estelle Ashkenazi, Ahoova Zeffren, Debi and Elie Benaron, Jory Goldman, Rena Horowitz, Jan Zakowski, Sherre Hirsh, Molly Matthieson, Brigitte Rosenberg, May Huang and J. Sikura, Erica Tucker, Susie Chodakiewitz, Elie Nankin, Lois Hellman and Sunda Zafrin. Heat oven to 350°F. Grease 10-inch tube pan. 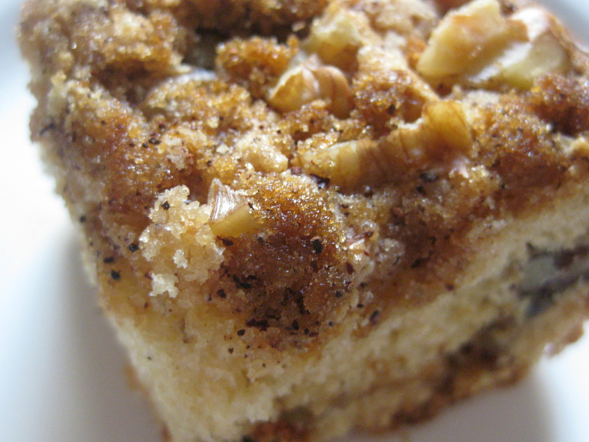 In small bowl, combine walnuts, cinnamon and 1/2 c. sugar. Use about 1/3 of this mixture to “dust” inside of tube pan. Set the rest aside for use later. 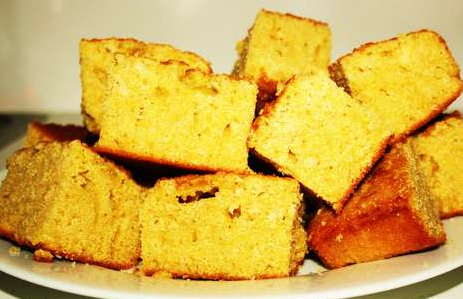 In large bowl with mixer at medium speed, beat butter or margarine with 1-1/2 c. sugar until light and fluffy. Add flour and remaining ingredients (do not include saved nut and sugar mixture); beat at low speed until blended, constantly scraping bowl with rubber spatula. Increase speed to medium; beat 3 minutes. Spread half of batter in pan; sprinkle with half of reserved nut mixture. Spoon in remaining batter, then sprinkle with remaining nut mixture. Bake 60 to 65 minutes, until cake pulls away from sides of pan. Cool cake in pan completely on wire rack. Makes 20 servings. Mix canola oil, white sugar and brown sugar until well blended. Beat in 2 egg whites and 1 egg. Add baking soda, salt, flour and mix well. Add vanilla extract. Fold in 1 pkg. 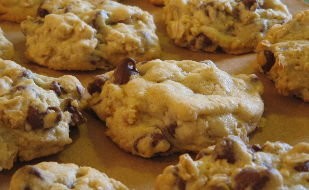 semi sweet pareve chocolate chips (Trader Joe’s are the best!) Arrange teaspoonfuls of dough on baking sheets lightly sprayed with non stick cooking spray. Bake at 350 degrees for 8-10 minutes or until lightly browned. Do not over bake! Let cool, (or not), devour and enjoy! Jewish comfort food + Southern comfort food = one giant dose of comfort. This fusion pairing of cornbread and cholent comes from our friend Sheila Leibovic, who hails from the great southern city of Atlanta. 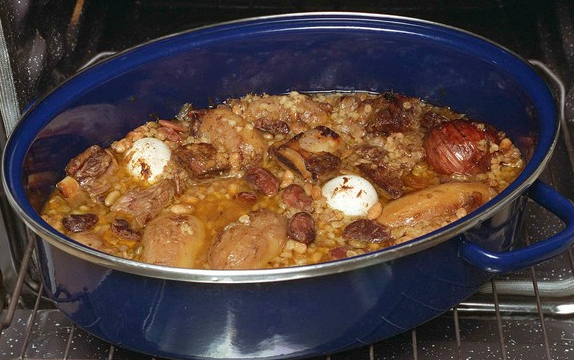 Cholent is one of those quintessentially Jewish dishes that we typically think goes so well with some spiciness — serrano peppers, say, or red chili flakes thrown in. During the time of mourning, though, adding extra flavors for enhancement felt a little…off. So we were grateful for these simple and hardy dishes on their own. Thank you, Sheila! Mix all ingredients and pour into pre-heated iron skillet (with 4 tablespoons vegetable oil heated) or use muffin pans (nonstick). Preheat oven to 425 degrees. Bake 20 minutes. Prepare and cook in crock pot the night before serving. Prepare cholent early evening (around 5 or 6 ). Pour oil in bottom of crock pot. Add beef, chopped onion, washed and dried beans. Pour 5 cups water over ingredients. Cook on high until 10 or 11pm. Cook on low until lunch next day. Ready to eat anytime after 10:00 am. 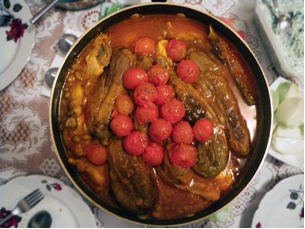 These Persian recipes came our way deliciously cooked by Jackie Ahdout. Growing up at Sinai Temple, Persian foods like tadig and kabob were something my family and I grew up with. So, even though they’re not our own culture, in a funny way, they are comfort foods for us. Plus, it’s impossible not to feel comforted by a hot stew. We love how healthy these particular comfort foods are. Jackie also included a recipe for white rice (polo), below. gently with slightly warm water. rice (called ta-dig) will form at the bottom of the pan. water. 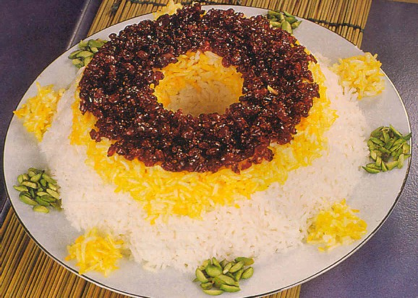 Add some rice to the saffron and add it to the rice for garnish. (butter optional) and fry the berries over medium heat for about five minutes. Can be served with roasted chicken or stew. hour. When meat is cooked, there should be about one glass of water left. a half cup sour grapes or limejuice. Add the mixture to the meat and let it simmer. 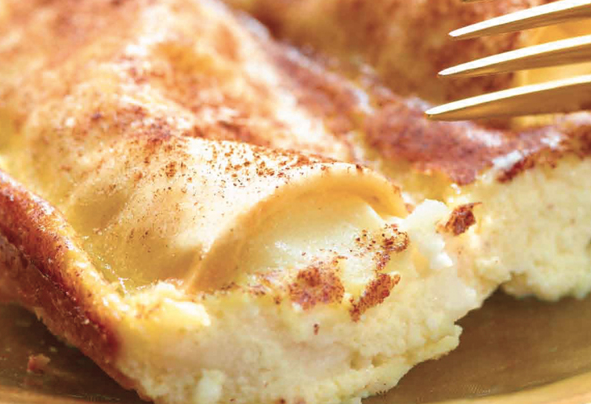 The Corn Pie is from Celia Szew, and the Cheese Blintz Souffle is from Laurie Levenson. 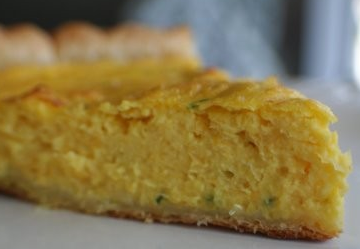 Incidentally, Celia is from Argentina, and we suspect the corn pie is a dish that reminds her of “home.” Turns out, the idea of home has a lot to do with comfort food: one definition of it is food that has a nostalgic memory to it. While Wikipedia doesn’t list Argentina (or Mexico’s) comfort foods, we do know, of course, that every culture has particularly homey or nostalgic dishes. Thank you to Celia and Laurie! Heat oven (350). Put empty crust on a shallow round baking dish, pierce all over with a fork and bake until cooked (not completely done). In the meantime, mix together all the other ingredients. Remember to cut the wedge in thin slices. Pour the mixture into the baked pie crust and put back in oven until done (about 20 min). Put frozen blintzes in casserole dish. Mix remaining ingredients and pour over blintzes. Bake 45-60 minutes at 350 degrees. Serve with sour cream, if desired. Serve warm or cold. NOTE: Recipe can be doubled. Cherry and blueberry blintzes can also be used and are delicious. Can substitute plain yogurt and egg beaters to lower fat and cholesterol in recipe. We didn't have the foresight to photograph the actual dishes, but this is a pretty good representation. 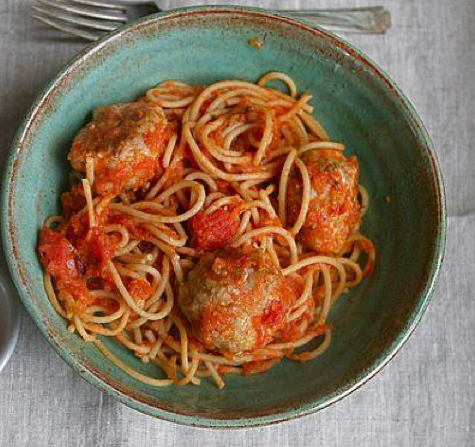 The first recipe of Comfort Food Week is…Meatballs in Tomato Sauce. meatballs and sauté in olive oil, browning both sides. tomatoes, tomato sauce, tomato paste and sauté for several minutes. about 1 1/2 hours on a low flame. COMFORT FOOD WEEK, in which we will share some of the delicious recipes our friends brought over during our down moments. My Mom didn’t have much of an appetite. You could see the prepared meals as an effort by the community to help her regain it. And while maybe the food itself couldn’t console, the love and caring with which it was prepared very much did. In times of sorrow, when words fail in their ability to express how much we care, we prepare food to help comfort . Tomorrow, the first recipe we share will be TURKEY MEATBALLS in TOMATO SAUCE, by our dear friend and cooking role model, Irene Saiger (AKA Bamitbach). Alex here. We have some sad news to share with you today. My maternal grandmother, Martha Schneider, passed away late last week. You may have heard her mentioned on this blog before. Martha Schlesinger was born in Budapest in 1923, moved to Tampico, Mexico at age 4, to Mexico City at age 18, to New York at age 24, back to Mexico at age 27, and finally to Los Angeles at age 41, where she lived and raised her 3 children (including my Mom, Susie) until she passed away on January 13th. If you caught the NPR story I did involving my grandparents, you got to hear her voice. My grandmother, like me, was not someone who particularly enjoyed cooking. She was fiercely focused on work, deciding to go to college at a time and place where it was unusual for women to do so. Eventually, she built an impressive career in fashion, first opening her own retail shops in Mexico, and later as a buyer for Bullocks near the company’s peak. Preparing meals wasn’t a big priority for her. When I’d drive up the mountain to my grandparents’ home, with its bright blue pool and views all the way to the beach, my grandma would heat tortillas, warm some refried beans and whip up a bit of guacamole — similar to what you might find me eating when I’m sitting in my apartment starving away. But, like me, she loved to eat. Some of her favorites were steak and veal, standard old tacos, slowly sipping on a little shot glass of tequila, and the Hungarian dishes that my mother prepares, chicken paprikash and nockedli. When we’d have dobosh for dessert at Shabbat, it was always a cause for celebration. Of all the places my grandmother lived and the cuisines she sampled, Mexican food was perhaps the strongest through line for her. I don’t think that’s too surprising. While much Eastern European food certainly is delicious, there’s a whole other rainbow of colors in Mexican cooking that can open up your palette. 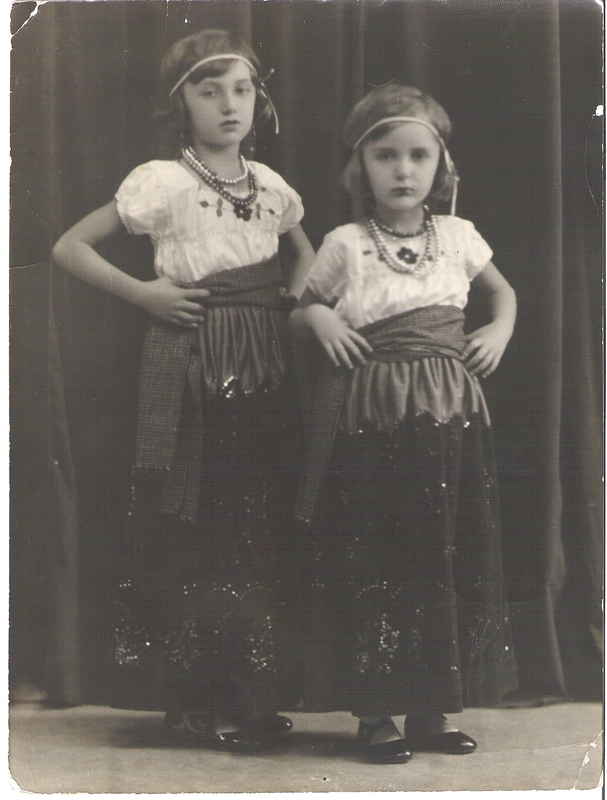 Those colors were scary for my grandmother at first, as the little girl and her littler sister, Edith, stepped tenuously into the streets of the Mexican port city where her family docked. But eventually, she found she couldn’t imagine life without those tastes. You don’t have to be a gourmet chef to be a big part of the food life of your family, and you don’t have to enjoy cooking, either, for food to mean a lot. Loving food is a sign of someone who loves life and, in my grandmother’s case, it was a proxy for love of family. To her, a meal was always an excuse for us to “enjoy” — which, come to think of it, is one of the words she said most throughout her life. 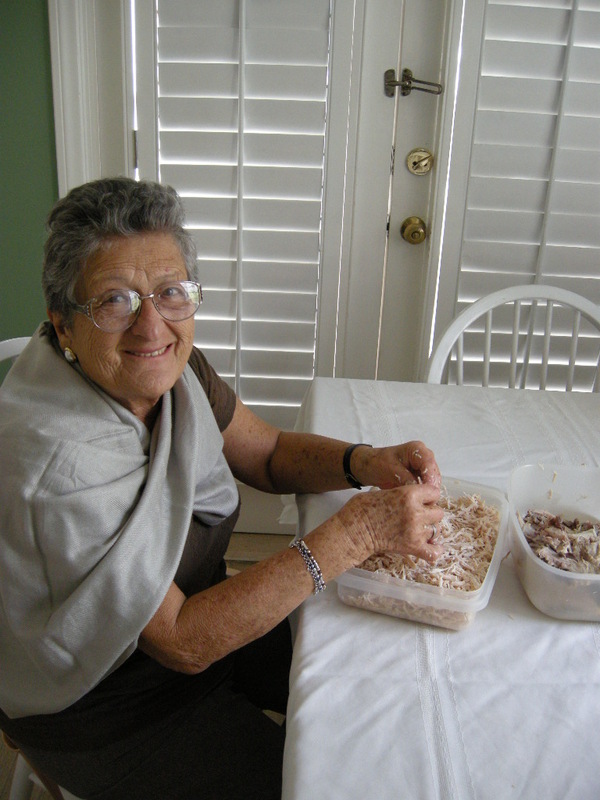 Grandma, I’m remembering you and the food you loved — today, and always. Happy Tuesday, and hopefully you’re still deep in holiday season relaxation. Alex here. Just a heads up for the people who missed it: I did a story about the connections between food and memory, and Mexican and Jewish cooking, and it ran Sunday on NPR’s Weekend Edition (Christmas Day). Here’s the link. It was cool to hear our family on the air, but of course we may be slightly biased. Some of you folks may be reading this blog because you heard the story on NPR. To you I say, thanks for listening, reading, and subscribing! I thought it would be cool to share some other pictures from the trip to Mexico City during which I reported the story. 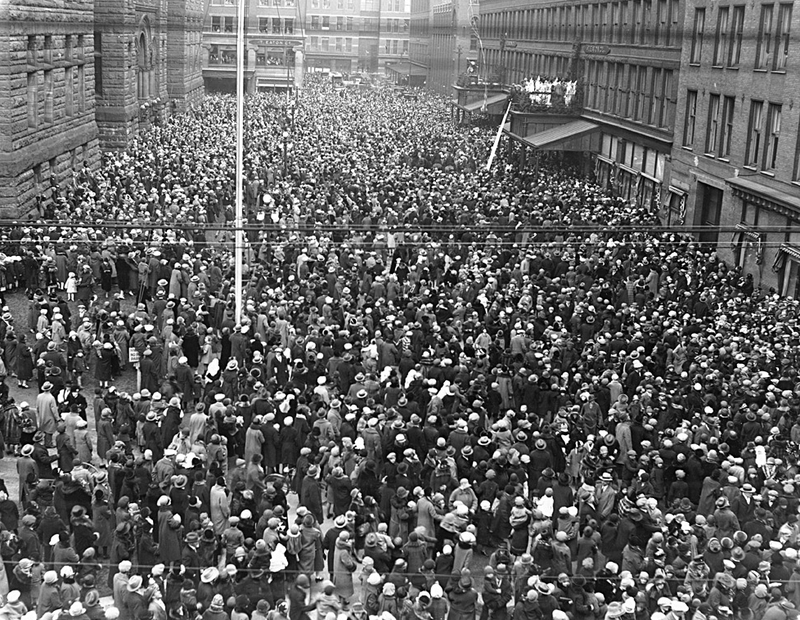 (I asked for help crowdsourcing cookbook research for that trip, and many people shared comments and suggestions — more on that soon, as the NPR piece has kept me busy.) Happy Holidays to you and your families! All photos are credited to my lovely sister, Anita Schmidt. 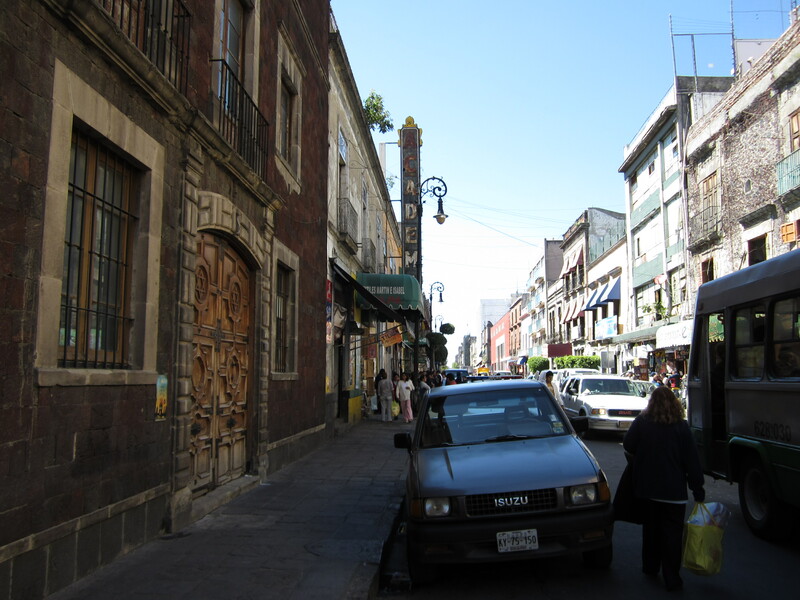 Justo Sierra Street in downtown Mexico City. 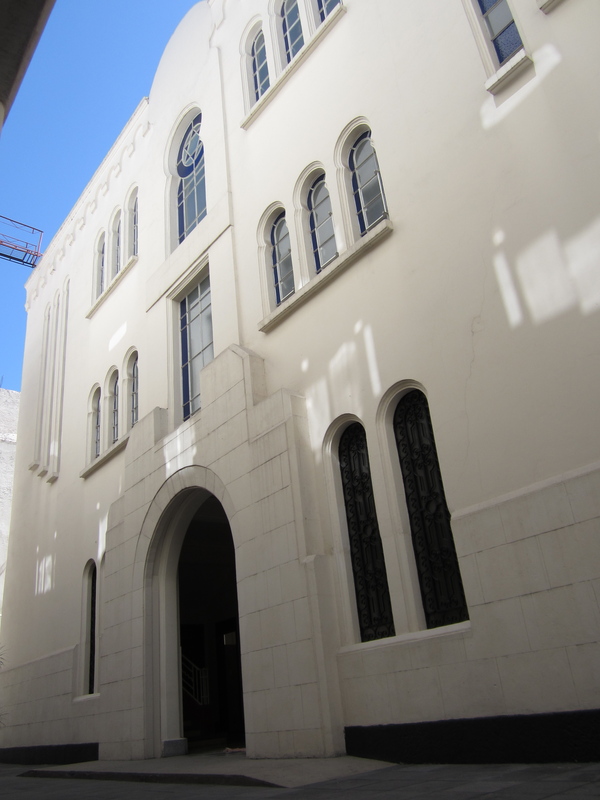 The doors of the synagogue are visible on the left. 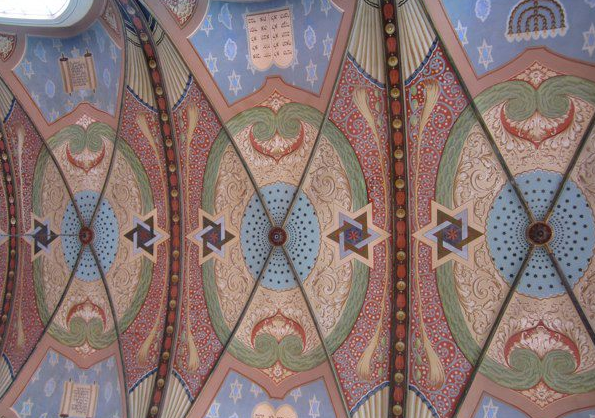 The interior of the temple has been beautifully preserved. Anita and I are standing with our grandmother where she greeted guests at her wedding (higher quality image fortcoming). 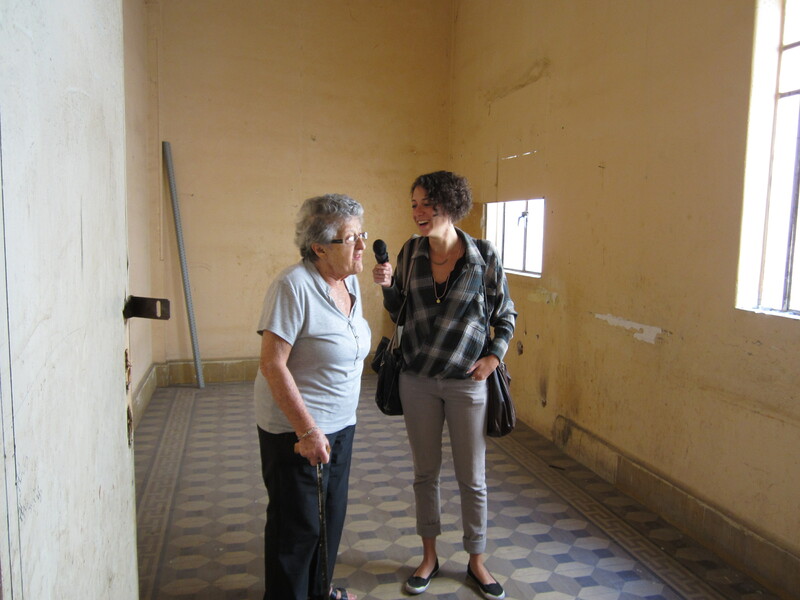 Me and my grandmother in the old temple kitchen where Mrs. Shlejter cooked her delicacies. You can see grease stains on the walls and ceiling. 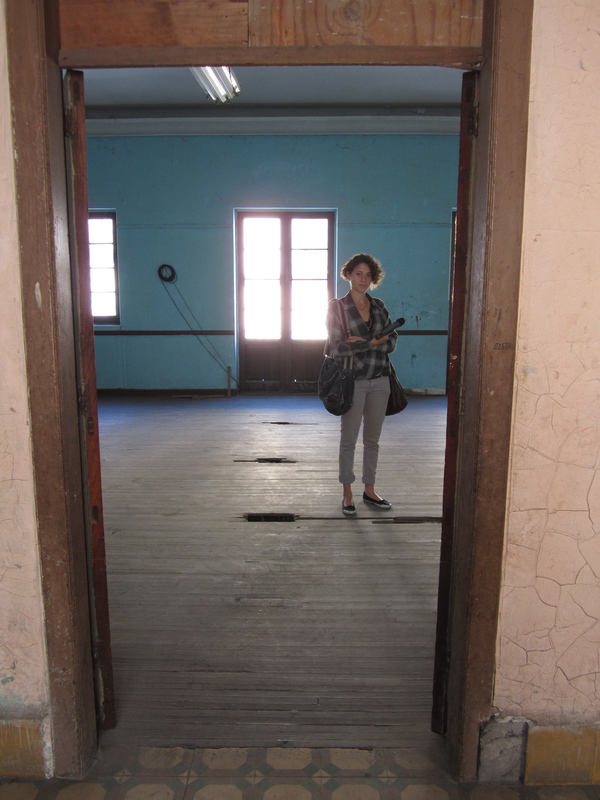 Me in the old temple restaurant where my great grandfather looked forward to eating when he visited Mexico from New York. Shout out to Anita (again) for a very cool shot.